The internal ear is made up of membranous labyrinth which is a closed system of fluid filled up intercommunicating membranous sacs and ducts. Endolymph is the fluid filled up in the membranous labyrinth. Inside the complex intercommunicating bony cavities and ducts (bony labyrinth) in the petrous part of the temporal bone lies the membranous labyrinth. Perilymph is the fluid that space between the membranous and bony labyrinth is filled with. The sensory receptors inside the membranous labyrinth are accountable for hearing and balancing (equilibrium). The internal ear is composed of 2 parts, viz. The cochlear duct is located inside the bony cochlea, the saccule and utricle be located inside the bony vestibule and 3 semicircular ducts be located inside the 3 bony semicircular canals. The cochlear duct (basal turn) is joined to saccule by ductusreuniens. The saccule and utricle are joined to every other by Y shaped utriculosaccular duct, which enlarges to create ductus and saccusendolymphaticus. The utricle is linked to 3 semicircular ducts via 5 openings. The sensations from cristae (kinetic equilibrium) and maculae (stationary equilibrium) are carried by vestibular nerve, while sensations of hearing from spiral organ are carried by the cochlear nerve. The sensory receptor inside cochlear duct is spiral organ of Corti. It’s concerned with hearing. The sensory receptors inside saccule and utricle are maculae. They’re concerned with static equilibrium. The sensory receptors inside the semicircular ducts are cristae ampullaris. They’re concerned with kinetic equilibrium. The cochlear duct is a coil anterior part of the membranous labyrinth having 2 and three fourth turns. It is located in the middle part of the cochlear canal between scalavestibuli and scala tympani. 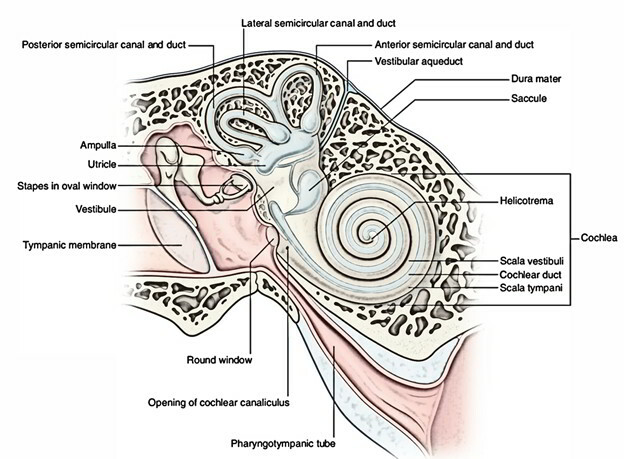 The cochlear duct includes spiral organ of Corti that is sensory receptor for hearing. 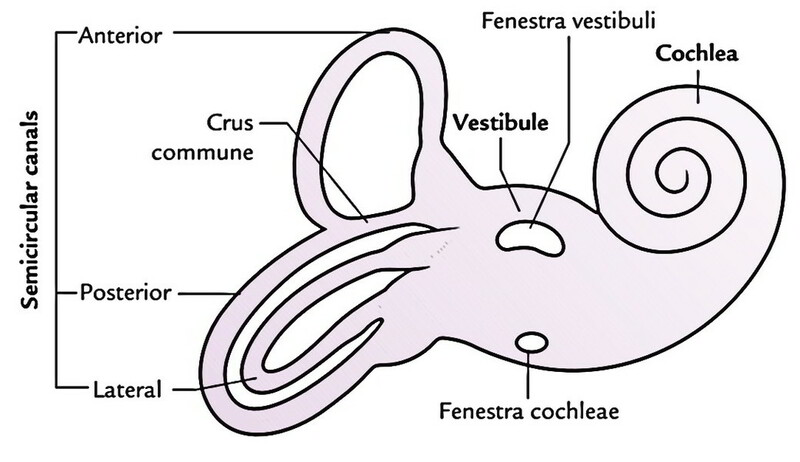 The structure of cochlear duct is best studied in cross section of the cochlear canal. In cross section, the cochlear duct is triangular in shape. Base: Created by the osseous spiral lamina (medially) and basilar membrane (laterally). Roof: Created by the vestibular membrane (Reissner’ smembrane), which enters from upper surface of spiral lamina to the wall of cochlea. 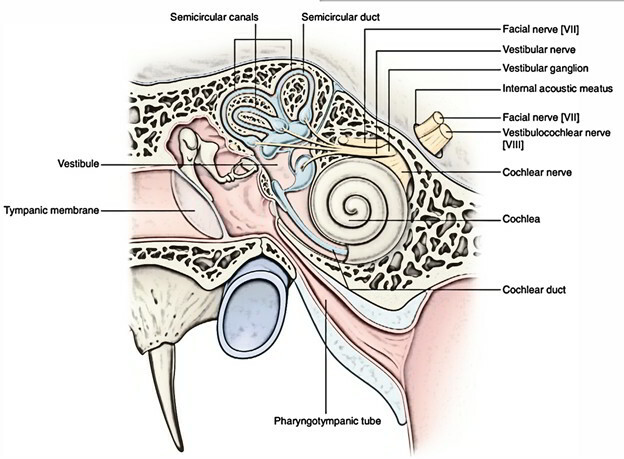 Laterally: It’s bounded by the outer wall of cochlear canal. Tunnel of Corti: It’s created by the inner and outer rod cells. It includes a fluid named corticolymph. The precise function of rods and corticolymph isn’t understood. Hair cells: All these are receptor cells of hearing found on basilar membrane and their apices possess stereocilia(hair) that are overlaid by tectorial membrane. The inner cells are flask shaped and ordered in one row while outer cells are cylindrical and ordered in three or four rows. When sound vibrations (in fact fluid waves) pass from perilymph of scalavestibuli to the perilymph of scala tympani, the basilar membrane bulge and the overlying hair cells are aroused. The inner hair cells are lavishly supplied by the cochlear nerve fibres and are accountable for transmission of auditory nerve impulses. The outer hair cells are innervated by efferent fibres from the olivary complex and are concerned with modulation function of inner hair cells. Supporting cells (Deiter’s and Hansen’s Cells): The. Deiter’s cells are situated between the outer hair cells and supply support to the latter. The Hansen’s cells is located outside the hair cells. Membranatectoria: It’s created from gelatinous substance and overlies the hair cells. Medially it’s connected to osseous spiral lamina. The shearing force between the hair cells and tectorial membrane stimulate the hair cells. The scalavestibuli and scala tympani comprising perilymph is located above and below basilar membrane respectively. 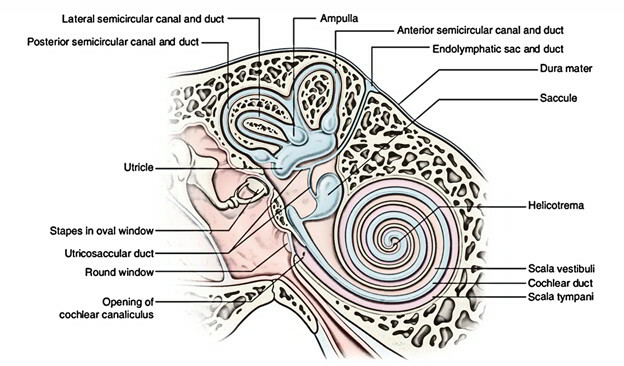 Hence cochlea duct (including endolymph) is bathed above and below by the perilymph inside the 2 scalae. The 2 scala are constant with every other via a narrow opening in the apex of cochlear duct named helicotrema. Ninety-five percent of afferent fibres (peripheral processes of bipolar neurons of spiral ganglion) supply the inner hair cells while only 5% supply the outer hair cells. The spiral ganglion is situated in the spiral canal inside the modiolus near the base of the spiral lamina. The central processes of ganglion cells create the cochlear nerve. Efferent fibres to the outer hair cells come from olivocochlear bundle. Their cell bodies can be found in the superior olivary complex. The saccule, a small globular membranous sac, is located in the anteroinferior part of the vestibule. The utricle is an oblong membranous sac and is bigger in relation to the saccule. It is located in the posterosuperior part of the vestibule. The saccule is joined in front to the basal turn of cochlear duct by the ductusreuniens and behind with the utricle by a Y shaped utriculosaccular duct. The vertical limb of ‘Y’ continues as endolymphatic duct (ductusendolymphaticus) and its dilated blind terminal end is termed saccusendolymphaticus. The endolymphatic duct goes through a bony canal (aqueduct of vestibule) in the posterior part of petrous temporal bone and its dilated terminal end projects on the posterior surface of petrous temporal bone underneath the dura mater of the posterior cranial fossa. The endolymph is absorbed by the epithelial cells lining the saccus and drains into extradural vascular plexus. The utricle gets the 3 semicircular ducts posteriorly via 5 openings. The 3 semicircular ducts-anterior, posterior and lateral is located inside the corresponding semicircular canals. They open into the utricle by 5 openings. Every duct has 1 dilated end named ampulla. It corresponds to the ampulla of the corresponding semicircular canal. The ampullary end of every duct bears a raised crest (crista ampullaris), which projects into its lumen. Maculae: All these are sensory receptors situated in the medial walls of saccule and utricle. They feel position of head in response to gravity and linear acceleration, i.e., static equilibrium. Cristae: These are sensory receptors situated in the ampullated ends of the 3 semicircular ducts. They react to angular acceleration, i.e., kinetic equilibrium. 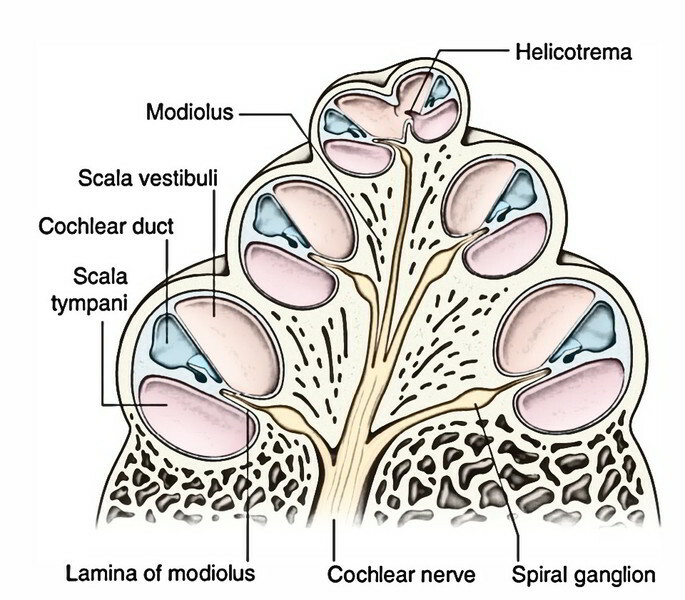 The vestibular or Scarpa’s ganglion is situated in the lateral part of the internal acoustic meatus. It is composed of bipolar neurons. The peripheral processes of these cells innervate hair cells of cristae and maculae, while their central processes aggregate to create the vestibular nerve. The bony labyrinth is composed of series of intercommunicating bony cavities and ducts inside the petrous part of the temporal bone. The cochlea resembles the shell of a common snail. Its apex (cupula) is directed in the direction of the medial wall of the tympanic cavity, while its base is directed in the direction of the bottom of the internal acoustic meatus. Modiolus is the axial bony stalk around which the cochlear canal coils. It’s like an elongated cone. The base of modiolus is located at the fundus of the internal acoustic meatus and apex points in the direction of the middle ear. The apex of the modiolus is overlaid by the apical turn of the cochlear canal. The modiolus is perforated spirally at its base in the internal acoustic meatus by the fibres of the cochlear nerve. Cochlear canal is arranged spirally around the modiolus and makes 2 and three-fourth turns. Its basal turn bulges into tympanic cavity as the promontory. A spiral ridge of bone named spiral lamina projects from the top layer of the modiolus into the cochlear canal like a thread of a screw. The free edge of lamina splits into the upper and lower lips. 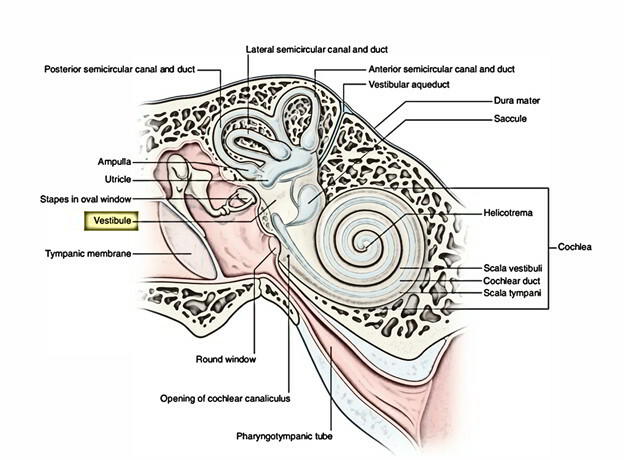 The vestibular membrane stretches from the upper lip of lamina to the outer wall of the cochlea, while basilar membrane stretches from the lower lip of the lamina to the outer wall of the cochlea. 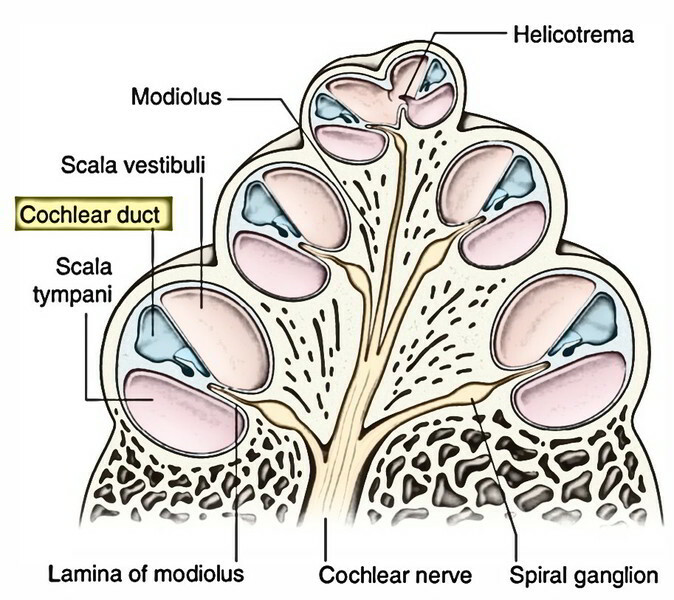 The triangular area so enclosed by the vestibular and basilar membranes and the outer wall of the cochlear canal creates the cochlear duct (scala media). The spiral lamina partially splits the cochlear canal into scalavestibuli above and scala tympani below. The scalavestibuli and scala tympani communicate with every other in the apex of the cochlea by a small opening referred to as helicotrema. The fenestra cochleae open into the tympanic cavity below and behind the promontory. It’s closed by secondary tympanic membrane in life. The aqueduct of cochlea is a narrow tubular canal via which perilymph inside the cochlea interacts with all the cerebrospinal fluid (CSF) of the subarachnoid space via cochlear canaliculus. The vestibule is a central ovoid cavity of bony labyrinth between cochlea in front and 3 semicircular canals behind. It is located medial to the middle ear cavity. The lateral wall of the vestibule interacts with the middle ear cavity by fenestra vestibuli, which in life is closed by footplate of stapes and annular ligament. The medial wall of the vestibule presents 2 recesses: a spherical recess in front and an elliptical recess behind. The 2 recesses are divided by the vestibular crest, which divides inferiorly to enclose the cochlear recess. The spherical recess lodges saccule and is perforated by foramina for the passage of lower section of the vestibular nerve. The elliptical recess lodges the utricle and is perforated by foramina for the passage of the upper section of the vestibular nerve. Just below the elliptical recess, there’s an opening of a bony canal referred to as aqueduct of vestibule, which reaches the epidural space on the posterior surface of the petrous temporal bone. The aqueduct of vestibule carries the tubular prolongation of membranous labyrinth, the saccus and ductusendolymphaticus. The anterior wall of the vestibule carries an opening, which interacts with scalavestibuli of the cochlear canal. The posterior wall of the vestibule carries 5 openings of 3 semicircular canals. The anterior semicircular canal is located in a vertical plane at right angle to the long axis of the petrous temporal bone. It’s convex upwards and its position is indicated on the anterior surface of the petrous temporal bone as arcuate eminence. Its anterior ampullated end interacts with vestibule anterolaterally. Its posterior non-ampullated end unifies with all the upper non-ampullated end of the posterior semicircular canal to create crus commune, which opens into vestibule. The posterior semicircular canal also is located in a vertical plane parallel to the long axis of petrous temporal bone. Its convexity is directed backwards. Its lower ampullated end interacts with the vestibule and is innervated individually by a branch of vestibular nerve, which goes through foramen singulare in the fundus of internal acoustic meatus. The lateral semicircular canal is located in the horizontal plane. Its convexity is directed posterolaterally. Its anterolateral end is ampullated and is located close to the ampullated ending of the anterior semicircular canal. Both the ends of the canal open directly into the vestibule. So 3 semicircular canals open in the vestibule by fiveopenings. 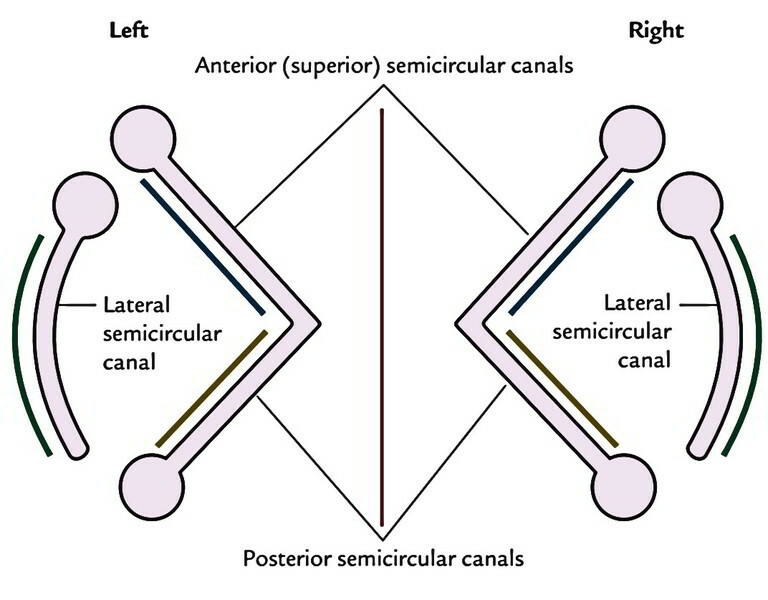 The lateral semicircular canals of 2 sides is located in exactly the same plane. The anterior semicircular canal of 1 side is located parallel to the posterior semicircular canal of the different side. The anterior and posterior semicircular canals, being located across and along the long axis of the petrous temporal bone, are every at 45 ° with the sagittal plane. Orbit and Eyeball.